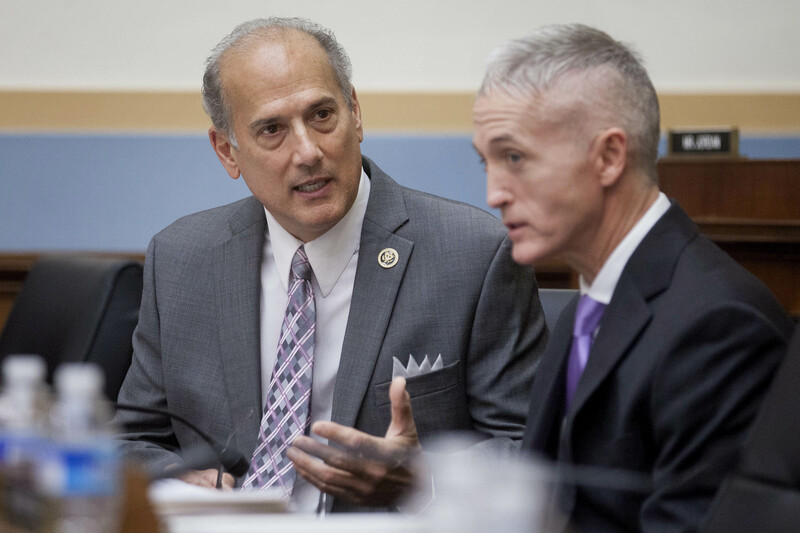 Tom Marino is a four-term Republican member of the House who represents a district in northeastern Pennsylvania that has been hard-hit by the opioid crisis. Yet Marino also has been a friend on Capitol Hill of the giant drug companies that distribute the pain pills that have wreaked so much devastation around the nation. Marino was the chief advocate of the Ensuring Patient Access and Effective Drug Enforcement Act, which requires the government to meet a higher bar before taking certain enforcement actions. The Drug Enforcement Administration fought against the bill for years, but finally relented last year after a leadership change at the agency. Marino is now President Trump's nominee to become the nation's next drug czar. Political action committees representing the industry contributed at least $1.5 million to the 23 lawmakers who sponsored or co-sponsored four versions of the bill, including nearly $100,000 to Marino. Overall, the drug industry spent $106 million lobbying Congress on the bill and other legislation between 2014 and 2016, according to lobbying reports. Marino declined repeated requests for comment. Marino's staff called the U.S. Capitol Police when The Washington Post and "60 Minutes" tried to interview the congressman at his office on Sept. 12. In the past, the congressman has said the DEA was too aggressive and needed to work more collaboratively with drug companies. Deeply involved in the effort to counter the DEA's tough enforcement campaign was the agency's former associate chief counsel, D. Linden Barber. While at the DEA, he helped design and carry out the early stages of that campaign, which targeted drug companies that were failing to report suspicious orders of narcotics that made their way into the hands of users and dealers. Barber declined repeated requests for an interview to discuss his role in formulating the legislation. Marino was a former county and federal prosecutor with deep ties to a hometown district that was reeling from the opioid epidemic. On Feb. 18, 2014, Marino introduced the Ensuring Patient Access and Effective Drug Enforcement Act, which raised the DEA's standard for suspending drug shipments by requiring that the agency establish "a significant and present risk of death or serious bodily harm that is more likely than not to occur." Nearly two months later, with the bill stalled, Marino confronted the nation's top law enforcement officer, then-Attorney General Eric H. Holder Jr., during a House Judiciary Committee hearing. Marino told Holder the DEA was treating the companies like "illicit narcotics cartels." "This mind-set — it's extremely dangerous to legitimate business," Marino said. He told Holder that he wanted the Justice Department to meet with industry executives. When Marino wrote to Holder three weeks later urging him to set up the meeting, the congressman added a handwritten note: "It would be great to work together on this. — Tom." In a Sept. 18, 2014, congressional hearing, Marino tore into then-DEA Administrator Michele Leonhart. By then, the legislation had passed the House and had stalled in the Senate. "It is my understanding that Joe Rannazzisi, a senior DEA official, has publicly accused we sponsors of the bill of, quote, 'supporting criminals,' unquote," Marino said. "This offends me immensely." Marino told Leonhart that Congress was sending the DEA a message: "You should take a serious look at your regulatory culture and seek collaboration with legitimate companies that want to do the right thing." Marino and Rep. Marsha Blackburn (R-Tenn.) demanded that the Justice Department's inspector general investigate the remarks by Rannazzisi, who ran the DEA's diversion control office. They said he had tried to "intimidate" members of Congress. An investigation was launched. Rannazzisi was replaced in August 2015 and retired that October. "That led to his undoing," said Matthew Murphy, a DEA official who worked with Rannazzisi in the diversion office. Rannazzisi had "very, very strong views" on what was happening on the street, Murphy said. "He wasn't going to change his opinion because of some heat." Marino told The Post last year the conflict boils down to one person — Rannazzisi. "We had a situation where it was just out of control because of [Rannazzisi]," Marino told The Post last year. ". . . His only mission was to get big fines. He didn't want to [do] anything but put another notch in his belt." The House passed the bill by unanimous consent. But it didn't make it through both houses of Congress until 2016, when Sen. Orrin G. Hatch (R-Utah. ), negotiated final language with the DEA and Justice Department. President Obama signed the bill on April 19. The White House issued a one-page news release announcing its enactment. Chief DEA Administrative Law Judge John J. Mulrooney II agreed. Scott Higham is a Pulitzer-Prize winning investigative reporter at The Washington Post, where he has worked on Metro, National and Foreign projects since 2000.